They're creepy and they're kooky — dirt cups are pudding parfaits with a crushed chocolate cookie topping that looks like freshly turned earth. Dig in! Sometime in the last 2,000 years, someone decided to make food to resemble the dirt you might dig up to clear the way for a coffin, worms and all. Creative crafters ran with the idea, leaving no tombstone unturned in the quest for the cutest, tastiest, and dirtiest Halloween treats. We’ve selected some of our favorites to cover almost all dietary preferences or restrictions… with dirt. If you haven’t dug up a good dirt cup yet, this classic Graveyard Dirt Cup is a good starter recipe. Basically, it’s a “mud” parfait. For the mud, it’s your basic chocolate pudding with a whipped topping folded into it. That’s layered with crushed chocolate cookies to resemble dirt and topped with bones and a headstone (of the sugar variety, of course). This one is for those who seek a plant-based treat but also want the fun of something creepy-crawling lurking in their cemetery in a mug. The pudding is made with dates, almond milk, chia seeds, and cacao powder (which is a less-processed, raw version of cocoa powder). It makes a pretty impressive pudding considering no cooking is involved. The “dirt” is made from an almond meal-cacao mixture sweetened with agave nectar. But what’s really amazing about this recipe is the freaky worms! They’re made with dates, almond meal, and cacao powder. If you serve these when the midnight hour is close at hand, they'll definitely terrorize y’all’s neighborhood. No graveyard is complete without a lost soul hovering above the crypts and prowling around the mausoleums. It’s a fairly simple addition to the sugary cemetery -- it’s stiff whipped cream piped onto the dirt in a spooky-swoosh to create an edible apparition. I ain’t afraid of no ghost made of whipped cream. Dietary restrictions don’t have to spoil a night of the living dead. Instead of the standard Oreo, this recipe calls for gluten-free cookie crumbs whirred in a food processor. It’s topped with organic gummy worms to give it the creepy-crawly charm of a real graveyard. This recipe is fit for a Charlie Brown Halloween. Instead of the earthy chocolate pudding, this recipe injects pumpkin puree into instant vanilla pudding to make this an exclusively fall dessert. But the real secret to this recipe that makes it standout is a sprinkle of cinnamon in the whipped cream. A milano-cookie tombstone is the final Halloween touch. If you’re paleo, you’re probably used to scaring up a lot of ingredients to come up with recipes to mimic modern food — a paleo dirt cup is no different. This recipe is intense, but impressive. Homemade paleo gummy worms? Yes! It takes effort, but it’s totally worth it for a hauntingly delicious dessert for a pro-paleo Halloween. 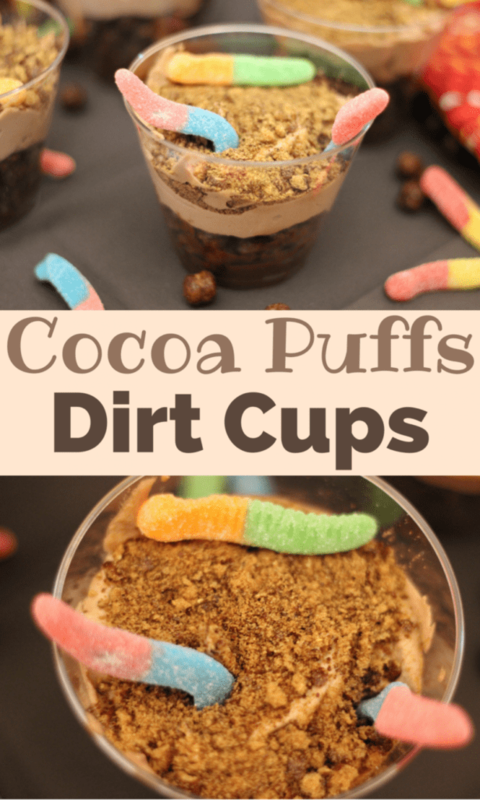 One of the lures of dirt cups is that most of the recipes use ingredients from mixes, making them quick and easy to make, but if you like the purity of scratch recipes, this is the one for you. It’s composed of homemade chocolate pudding and homemade whipped cream. Creatures crawling in search of cereal are in luck with this recipe. Instead of chocolate cookies to simulate dirt, this recipe uses crushed Cocoa Puffs. What makes this one really fun: The pudding mix gets darker and more intense the deeper you dig. Clean eaters don’t have to declare a cheat day with this dirt cup recipe. The pudding is a homemade chocolate pudding and instead of using crushed cookies, this recipe recreates dirt using dates, nuts, and chocolate pulsed in a food processor. It doesn’t stray too far from its time-saving counterparts and still gives you all the dirt you need to recreate that sweet cemetery atmosphere to make this a clean Halloween treat. Once the graveyard shift ends, it'll be time to start thinking about Turkey Day. When you’re done sweeping out the Halloween cobwebs, let Yummly help plan your Thanksgiving menu.